I didn't realize it until later on, but I had a lot of friends in middle school! Sure, they weren't the coolest kids around, but they were kind and they cared about me. But instead of nurturing those little relationships and realizing how fortunate I was to have them, I was focused on being one of the popular kids. It's something I still struggle with, to some extent. I have this need to please people to make them like me. I love people. I love being needed and being helpful and being liked. And in of themselves, none of those things are bad, but too often I neglect other, better things in place of pleasing people. Like when I burn myself out at work because I want to be valuable to my boss. Or when I reject total honesty in place of telling a funny (although exaggerated) story. Or when I spend half an hour online looking for an article I saw three months ago so I can give the link to a total stranger on Facebook because I think it would help her out.... and in doing so, mess up my family's plans. I seek the acceptance and approval of other people (often strangers or people I don't know well) at the expense of the people closest to me. I have to be liked. I have to be needed. I have to be valuable. And while there are positive things about this vein that runs through me (God put it there, after all), I take it too far too often. Jesus's public ministry starts with a bang- he hangs out in Capernaum, teaching, driving out demons and healing the sick. Everyone wants to be near him, everyone wants to be healed. He's doing incredible things and helping people-- why wouldn't he turn into an instant celebrity? People are fascinated by his power and by the authority with which he's teaching. He's saying new things, he's doing new things, and he becomes extremely popular very quickly. They've left their homes, families, jobs- and now it's finally starting to look like all that sacrifice was worth it. This following Jesus thing is paying off. The disciples are part of the inner circle of a hugely popular celebrity. They feel accepted, they feel needed, they feel valuable. These fishermen with newfound celebrity status are riding a wave of popularity- they can see the kingdom coming, they can see Rome being overthrown and their people finally free. It's exciting and intoxicating and they can't wait to see more. They'd had days of amazing, incredible experiences, watching miracles take place. I am sure the energy was vibrant and full of hope. And then all of the sudden, they woke up and their star was missing. In the middle of all the fame and popularity, Jesus was gone- in a solitary place- praying. When the disciples find him, Simon Peter reveals his heart. "Everyone is looking for you!" I wish I could hear the tone of voice, there, don't you? I think Peter was a little exasperated, a little annoyed that Jesus had just upped and left in the middle of such a huge and powerful revival. Didn't he know how popular he was? Didn't he know how many people were waiting for him? It didn't make sense to cut this short. They had momentum! They had name recognition! They had fame! But Jesus didn't come to be a celebrity. He didn't come to gain a huge fan base of so-called followers who were in it for the fame and drama. The disciples are focused on pleasing the people, Jesus is focusing on connecting with the Creator. The disciples are focused on work and accomplishment, and Jesus is focusing on balance and rest. The disciples want huge numbers and a wide revival, but Jesus wants true believers who have deep love and committed hearts. The disciples have it all wrong. 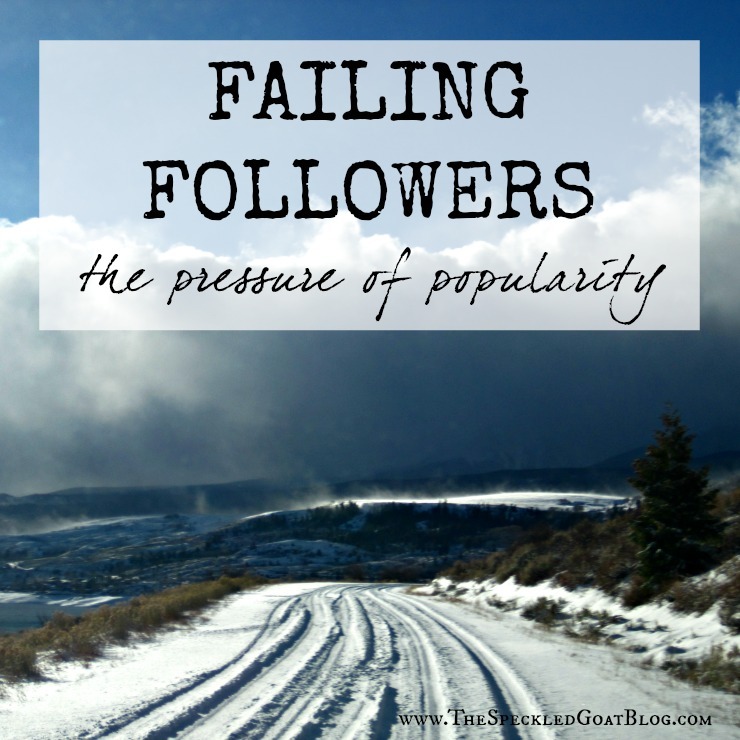 They're failing followers because they believe that the ultimate measure of Jesus' ministry is popularity and fame. They neglect the important things in favor of seeking something lesser. Yes, the beginning of Jesus's ministry is exciting and spectacular and filled with hope and joy- but he also wants followers who will stick around in the hard things- the fear, sacrifice, and pain that is to come. Jesus doesn't want relationships that stay on the surface, or the support of people who only stand by him when he's popular. He wants true followers, he wants true friends. And so Jesus brings about a change of scenery, a change of focus, and with it, a change of hearts. They leave a booming revival gathering to go somewhere else- a nearby village- to start over again. He reminds them why he's here, that he's come to preach, not to be the new trend. He points them back to the real reason behind what they're doing- brings it back into focus. Numbers and fame and popularity and the approval of others? Not the right things to focus on. It's a lesson Jesus is teaching me, too. This people-pleasing streak in my heart? I can use it for good. There are so many good things about being a helper, about being an advocate, about being empathetic. But when making other people happy- when being wanted and accepted and popular- becomes the main focus, everything falls apart. It's only when I bring myself back to what's important- connecting with God, rest and balance, love and commitment- that I am able to do all the things with the right heart and the right attitude. When my focus is right, my heart is right. What are you focusing on, today? Is it making yourself valuable to the people around you? Is your mind fixated on numbers- number of Facebook friends, number of Twitter followers? Are you stuck trying to measure up to some other person's standards? Are you doing something good, but for the wrong reasons? Is your heart striving to be accepted or wanted by people you claim as friends? You are one in whom Christ dwells. You live in the unshakable Kingdom of God. Read it again. Let it sink in. Who are you? Where do you live? You don't need to measure up to the expectations of another human being- you are enough in Christ. You are valuable and wanted- Jesus died for you. Popularity is fleeting and shallow- you are loved by One who knows you inside and out and loves you. You have a purpose here, and it's not to win a popularity contest. And so I'm asking that God would take my fumbling and my failure and teach me to follow better. To follow hard, even when it's unpopular. To Serve in the small, unnoticed places- not just in the flashy and dramatic. And to keep my focus on what really matters. I'm a people pleaser as well. That is one lesson I am learning as well. YES!!!!! It's so easy to get caught up in the people pleasing cycle! BUT I love have you turned it around and expressed that we can use those habits for good if we refocus. Most people have an inborn desire to be liked, wanted and needed...as you have noticed, when these desires get out of balance is when things go wrong. Love reading your insights into the Bible and yourself - for such a young whippersnapper, you have a great deal of self-awareness and wisdom to share! Ugh. I'm such a people pleaser. It's so easy to get hung up on earthly things, but God is so much greater - and knowing that we are HIS is the most important thing we could ever focus on. Thanks for this beautiful reminder! Yes, as Donna mentioned above...living for the audience of ONE has been my heart's desire. It's far too easy to get caught up in the people pleasing. Thanks for the great reminder! I feel the same way! Sometimes I always 2nd guess my movements when it's not recieved in the way I intended, even though at the time there was nothing wrong with what I was doing! Oh, that people pleasing. I've struggled with it, too. Sometimes I think I have a handle on it, but it has a way of sneaking back in! Thanks for this great reminder of what's really important. 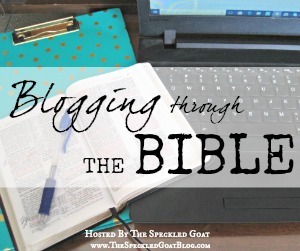 Thanks for sharing your thoughts on this journey through the Word. So important that we not fall back into those Middle School patterns with our adulation of the popular or our comparison and rejection of our own God-given beauty and giftedness.